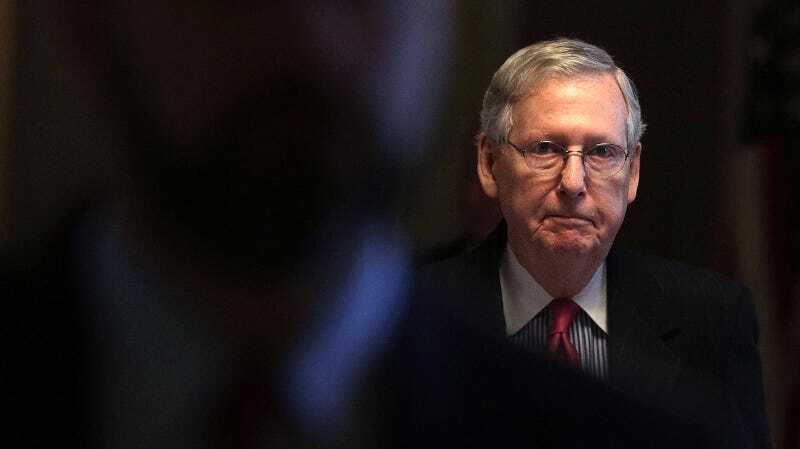 While the Trump Administration Hydra grows a new venomous head nearly every hour, a handful of Senate Republicans are quietly trying to push through an Obamacare replacement bill before the July 4th recess. Wyoming Republican Sen. John Barrasso told CNBC on Monday that 52 Republican Senators are “all wanting to get to yes to find a solution,” and believes “we’re going to vote before the July 4th recess.” Happy Independence (From Having Health Insurance) Day, America. Even some Republicans are frustrated by the closed-door meetings. “The process is better if you do it in public, and that people get buy-in along the way and understand what’s going on. Obviously, that’s not the route that is being taken,” Tennessee Sen. Bob Corker told the New York Times. “Until I see the bill and the (Congressional Budget Office) assessment of the bill, I’m not going to feel comfortable taking a position,” Maine Sen. Susan Collins told CNN. Senate Democrats, meanwhile, are outraged. They are reportedly planning to bring the chamber to a halt starting Monday in protest to force Republicans to bring the bill to a committee rather than directly to the floor and to delay the vote. They will also block requests that require unanimous consent or at least 60 votes.